A new piece of equipment came out at the same time as Insanity Asylum, a pull-up assist (or as they call it “Chin-Up Max”). For anyone who is doing assisted pull-ups, you probably use a chair. And this works great (and is free!). However, I wanted to give this new pull-up assist a try and figured the best way to show it off was through a video. In the video I highlight how to hook it up, how it works, what are the advantages of it over a chair, etc. By the way, I am wrong on the price in the video. It is $29.95. 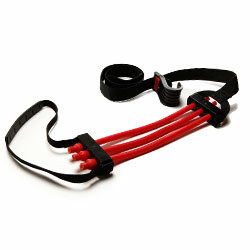 If you are interested in finding out more or purchasing the Pull-Up Assist, check it out HERE. Great review Coach Mike. I was on the edge about buying this. You confirmed that is should be part of my equipment! Yeah. It may be right for some and not for others. But hopefully the video helps you determine that. I’m looking for some input on this, I don’t have a tall doorway or anything really to put this high off the floor. I’m 6’5 is this still effective if your legs are like out in front of you or wrapping it around the knee with a knee bend or something? Hey Shay! – I assume you are using an in-door pull-up bar? How tall is the doorframe? I dont know if any solution will be ideal, but putting a knee in here is possible. It may actually do better than a chair. Feel free to shoot me an email at TeamRightNow@gmail.com if you want to chat some more.